I've always loved choosing names. I've been making up stories for as long as I can remember, and choosing the name of the main character was always my favourite part. I remember inventing a girl called Octavia, Coky for short, who was bullied at school, and one called Clancy who ran away from home. I used to have a trick for getting myself to sleep that involved names, too. Instead of counting sheep I would think of first names for all the letters of the alphabet. That didn't take long, so it soon changed to 26 girls' names beginning with A, 25 beginning with B, and so on down to one beginning with Z. They had to be traditional names. I wasn't allowed to make them up. The three Xs were always Xanthe, Xanthippa and . . . I can't remember the last. Then if I was still awake, I'd do the same with boys' names, which were harder, because there aren't so many traditional boys' names. Try it sometime when you can't sleep! It works pretty well, at least until you've done it so often that you have all the names memorized. When I was planning Out, Proud, and Prejudiced, my male/male retelling of Pride and Prejudice, I tried to link the names with the originals. Some authors use the same names for a retelling. I couldn't do that, first because I've changed the gender of a lot of the characters; second because the Bennet sisters become friends in my version, so they all have different last names; and third because my story isn’t an alternative but an addition. 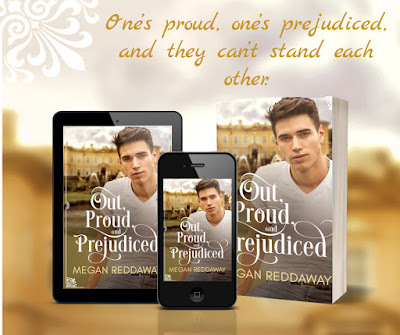 The events of Pride and Prejudice have happened, many generations ago, and now we have a similar story playing out in the same places. Meryton has grown and is now spelled Meriton; Pemberley is still standing, and so is Netherfield Park, although they aren’t single-family homes now. So in the end the character names were kind of random. With Darcy I took his last name and turned it into Darius. I didn’t think Fitzwilliam suited him, and I didn’t call him Darcy because I wanted to have more freedom with him—I didn’t want him to be so closely bound to Jane Austen’s character. 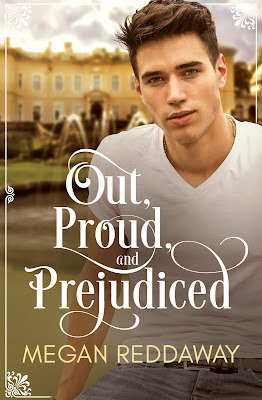 And I used Elizabeth's last name of Bennet for my main character’s first name, although he did have a name starting with E at first, which I changed because it was used in a retelling of Sense and Sensibility published recently. The secondary characters often share an initial and maybe some assonance (a similar vowel sound). Jane becomes Jamie, Mary becomes Marlon (kind of . . . Marlon's not much like Mary in character, but he's different from the others and yet more closely related to Bennet). A couple of the female characters have the same first name as their original—Charlotte, Catherine—but Anne becomes Annabel. I didn't follow any single rule. One advance copy reviewer has spotted that there's no link between the names of my Tim Wilson and Jane Austen's Charles Bingley. That's true (except for the "i" sound in Tim and Bing), but there’s connection that’s not about the names. The same kind of thing happens with at least one other character. I won’t go into details because you might enjoy spotting them for yourself. In fact, with Tim, I did have other ideas in the beginning. First I was going to call him Ben, using B for Bingley as D for Darcy becomes Darius. But that wasn't possible with Bennet as my main character. Then I considered calling him Charles, like the original, but there were already a lot of names beginning with C. (Jane Austen didn’t have an editor telling her not to confuse readers with too many similar names, but I did.) So he’s Tim, for no other reason than it seems to me to suit him.